Containers are the interface between a component and the low-level, platform-specific functionality that supports the component. Before it can be executed, a web, enterprise bean, or application client component must be assembled into a Java EE module and deployed into its container. every component type. Because we do not have to develop these services ourself,we are free to concentrate on solving the business problem at hand. 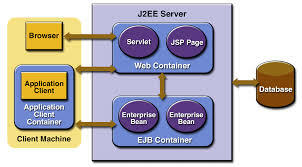 EJB container: Manages the execution of enterprise beans for Java EE applications.Enterprise beans and their container run on the Java EE server. Web container: Manages the execution of web pages, servlets, and some EJB components for Java EE applications. Web components and their container run on the Java EE server. components. Application clients and their container run on the client. Applet container: Manages the execution of applets. Consists of a web browser and a Java Plug-in running on the client together.